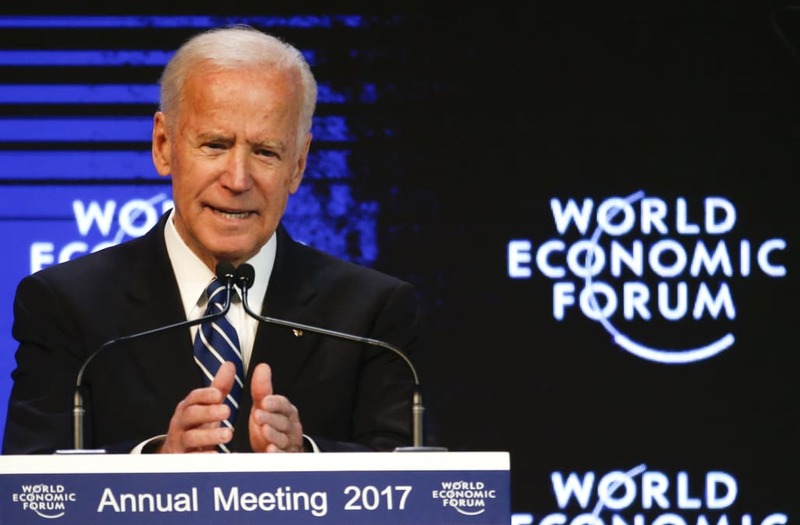 DAVOS, Switzerland — Vice President Joe Biden came into office in 2009 urging a "reset" and cooperation between the members of the North Atlantic Treaty Organization and Russia. He is set to leave it stressing a different approach — one in which Europe and the United States stand together to denounce what he framed as a fundamentally different vision between the West and Russia over the future of the world order. "Russia is working with every tool available to them to whittle away at the edges of the European project, test for fault lines among Western nations, and return to a politics defined by spheres of influence," Biden said at the World Economic Forum, during his final major speech in his official capacity. US President Barack Obama awards Vice President Joe Biden the Presidential Medal of Freedom during a tribute to Biden at the White House in Washington, DC, on January 12, 2017. Vice-President Joe Biden speaks after he received the Medal of Freedom from President Barack Obama during an event in the State Dinning room of the White House, January 12, 2017 in Washington, DC. U.S. President Barack Obama hugs Vice President Joe Biden after presenting him the Presidential Medal of Freedom in the State Dining Room of the White House in Washington, U.S., January 12, 2017. U.S. President Barack Obama presents the Presidential Medal of Freedom to Vice President Joe Biden in the State Dining Room of the White House in Washington, U.S., January 12, 2017. Vice-President Joe Biden reacts as President Barack Obama delivers remarks during an event in the State Dining room of the White House, January 12, 2017 in Washington, DC. WASHINGTON, DC - JANUARY 12: (AFP OUT) U.S. Vice President Joe Biden wipes his eyes as Preident Barack Obama presents him with Medal of Freedom during an event in the State Dinning room of the White House January 12, 2017 in Washington, DC. US Vice President Joe Biden wipes away tears after President Barack Obama awarded him the Presidential Medal of Freedom during a tribute to Biden at the White House in Washington, DC, on January 12, 2017. Vice-President Joe Biden gets emotional as President Barack Obama delivers remarks during an event in the State Dinning room of the White House, January 12, 2017 in Washington, DC. U.S. President Barack Obama delivers remarks at a tribute to Vice President Joe Biden in the State Dining Room of the White House in Washington, U.S., January 12, 2017. U.S. President Barack Obama looks at his watch as he reacts to Vice President Joe Biden speech in the State Dining Room of the White House in Washington, U.S., January 12, 2017. U.S. Vice President Joe Biden wipes his eye after President Barack Obama presented him the Presidential Medal of Freedom in the State Dining Room of the White House in Washington, U.S., January 12, 2017. US Vice President Joe Biden wipes away tears as he walks past President Barack Obama after he was awarded the Presidential Medal of Freedom during a tribute to Biden at the White House in Washington, DC, on January 12, 2017. Vice-President Joe Biden speaks after he received from President Barack Obama the Medal of Freedom during an event in the State Dinning room of the White House, January 12, 2017 in Washington, DC. US Vice President Joe Biden acknowledges applause after President Barack Obama awarded him the Presidential Medal of Freedom during a tribute to Biden at the White House in Washington, DC, on January 12, 2017. U.S. President Barack Obama looks at his wife Michelle and his daughters Malia and Sasha during an event in the State Dinning room of the White House, January 12, 2017 in Washington, DC. Obama presented the Medal of Freedom to Vice President Joe Biden. U.S. President Barack Obama shakes hands with Vice President Joe Biden after presenting him the Presidential Medal of Freedom in the State Dining Room of the White House in Washington, U.S., January 12, 2017. U.S. Vice President Joe Biden reacts as President Barack Obama delivers remarks to tribute him in the State Dining Room of the White House in Washington, U.S., January 12, 2017. With President-elect Donald Trump set to be inaugurated Friday, the mood among the world's economic elite is one of uncertainty and concern. Biden's final message was delivered with them in mind. He warned of a continued clash over Western ideals, implicitly rejected platforms laid out by Trump and figures like him, and stressed the importance of NATO in the face of Russian aggression. "I'm here today to issue a call to action: We cannot wait for others to write the future they hope to see. The United States and Europe has to lead the fight to defend the values that have brought us to where we are today," he said. Biden framed that immediate clash as one between the West and Russia, amid US intelligence agencies' conclusions that the Russian government, instructed by President Vladimir Putin and his top allies, meddled in the US presidential election with the goal of boosting Trump. With upcoming elections and rising populist parties and figures in France, Germany, and elsewhere in Europe, Biden did not mince words. He cautioned they would do so again. He took aim at their military incursions elsewhere, including Ukraine, where Biden has traveled frequently as vice president. And he scolded them as seeking to impose their will through "military might, corruption, or criminality." "Their purpose is clear — to collapse the liberal international order. Simply put, Russia has a different vision for the future, which they are pursuing across the board," Biden said. He continued: "They seek a return to a world where the strong impose their will through military might, corruption, or criminality — while weaker neighbors fall in line." And though he opened his speech by saying his suggestion of "uncertainty" in the word was not a reference to the presidential transition process, his speech contained clear allusions to the ideals and visions Trump has espoused. He said globalization was not an "unalloyed good," but warned against protectionism and those who "hunker down, shut the gates, build walls." And Biden said the NATO alliance was perhaps more important now than ever, a statement that came days after Trump had again called it "obsolete" and argued many of its European nations should contribute more financially. "The single greatest bulwark for our transatlantic partnership is the unshakable commitment of the United States to all our NATO allies," he said. "An attack on one is an attack on all. That can never be called into question." Biden's speech ended with something of a metaphor. He was nearly finished with his remarks when the lights on stage abruptly went dark, only his silhouette remaining visible. And though the lights went out on Biden — and the Obama administration — the vice president suggested he would remain a voice in the conversation. "I will continue to use my voice and my power as a citizen, doing whatever I can to keep our transatlantic alliance strong and vibrant, " he said. "Because our common future depends upon it."